Locales are a means to define local scopes for the interactive proving process of the theorem prover Isabelle. They delimit a range in which fixed assumption are made, and theorems are proved that depend on these assumptions. A locale may also contain constants defined locally and associated with pretty printing syntax. Locales can be seen as a simple form of modules. They are similar to sections as in AUTOMATH or Coq. Locales are used to enhance abstract reasoning and similar applications of theorem provers. 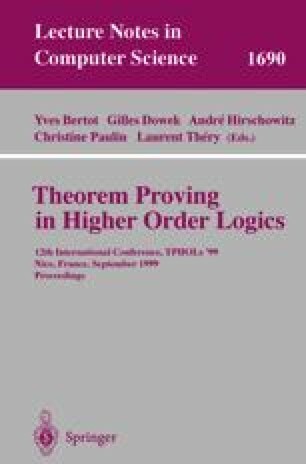 This paper motivates the concept of locales by examples from abstract algebraic reasoning. It also discusses some implementation issues. S. Owre, N. Shankar, J.M. Rushby, and D.W.J. Stringer-Calvert. PVS Language Reference. Part of the PVS Manual. Available on the Web as http://www.csl.sri.com/pvsweb/manuals.html, September 1998.